Over 2000 crisis victims are said to be currently undergoing free summer classes at Mangu's GSS Bwalbwang, Gindiri, Ekan Primary School Mangu and MCSS Kerang in Central Plateau courtesy Dr. Hassan Jingina, a young philanthropist. The program is being implemented by the Mangu Graduates Development Initiative under the sponsorship of Jingina Empowerment Foundation. Beneficiaries are said to be drawn from the three zones in Mangu - Pyem,Tim and Mangu central. 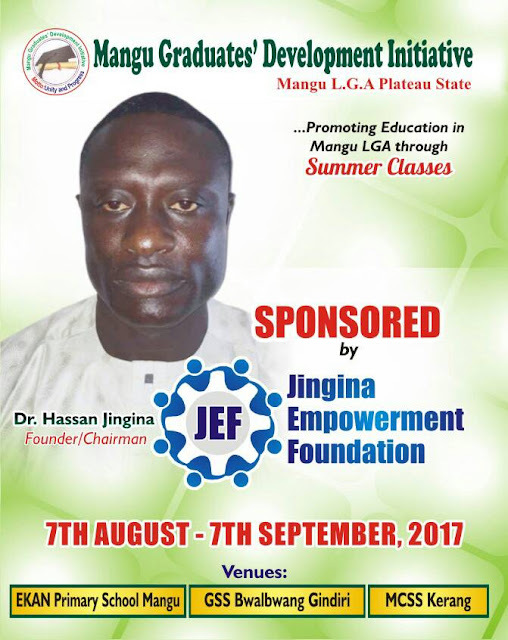 Sources say this effort is one of Jingina's numerous efforts at transforming lives especially those affected by crises in Mangu LGA. Aside the donation of relief materials worth millions of naira to IDPs, Dr. Jingina is said to have donated several bundles of roofing sheets for the construction of a primary school in Mairana village in the LGA. He is reported to have equally donated about seven trailer loads of cement for the construction of a standard Chiefdom Secretariat in Gindiri. Dr. Hassan is said to also be involved in the sponsorship of peace football competitions, free medical care and among others, peace dialogue fora.